This monograph presents approaches to characterize inelastic behavior of materials and structures at high temperature. Starting from experimental observations, it discusses basic features of inelastic phenomena including creep, plasticity, relaxation, low cycle and thermal fatigue. The authors formulate constitutive equations to describe the inelastic response for the given states of stress and microstructure. They introduce evolution equations to capture hardening, recovery, softening, ageing and damage processes. 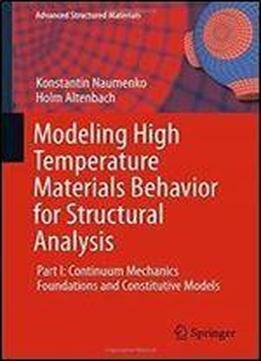 Principles of continuum mechanics and thermodynamics are presented to provide a framework for the modeling materials behavior with the aim of structural analysis of high-temperature engineering components.